This month's top pick is >> THIS << clever and jaw dropping card interactive by Anna Kossakovskaya! Seriously how perfect is this cutie? 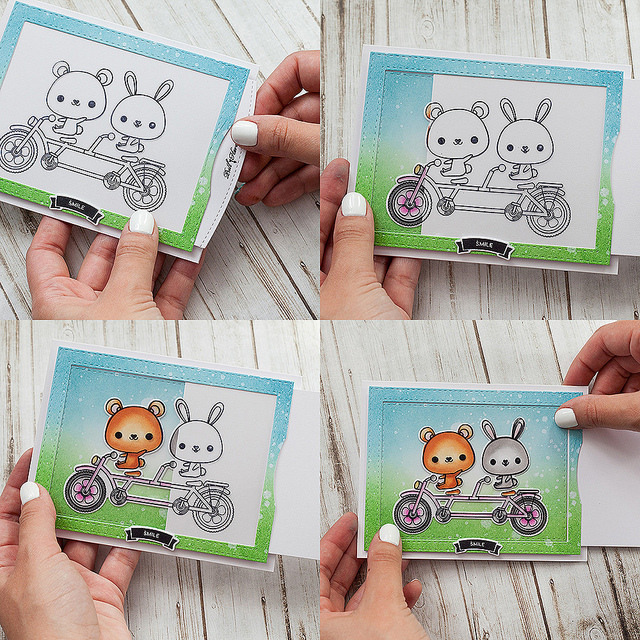 We love, love how she colored this Tandem Ride set and the interactive part is beyond cool. It's like magic! I know I would sure love to receive this gem! Anna is quite the talented designer, so check out the rest of her flickr feed! Loving all of it! Congrats, please email us at mamaelephant.winner@gmail.com with your selection of TWO Mama Elephant stamps of your choice along with your mailing address! Isn't THIS card by Jilly Neary super fun and happy? How gorgeous is THIS hello card by francesca? And finally, there is so much movement created by the watercolors on THIS card by zarischka! Beautiful!!! The new challenge for the month of September is to create a shaped card. Let's make this one fun! Wow thank you so much for picking my card!! And for inspiration your stamps give us! Congratulations to Anna for winning, your card is spectacular! Where can I find instructions on how to make this card?